ALASKA BORDER DISPUTE ON CROSSCURRENTS, 10/19 – Doggedly Yours… Howling, Humor, and History. ALASKA BORDER DISPUTE ON CROSSCURRENTS, 10/19: A tribunal arbitrated a resolution of the disputed boundary between Alaska and British Columbia though the Canadian delegates announced on this date in 1903 their refusal to sign. 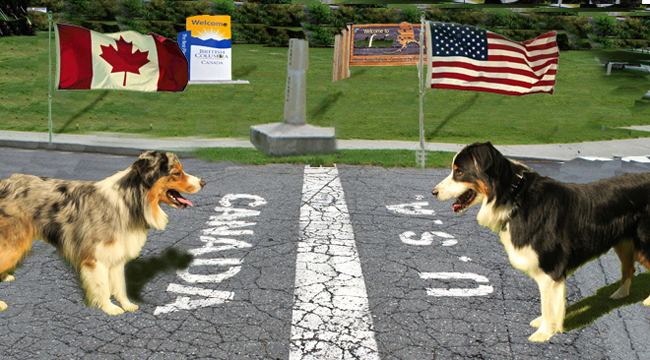 Gavin and Wyatt stare down each other across the border line as did the negotiators in the 1903 Alaska border dispute. You are invited, not to the negotiation table, but rather to the radio show of Crosscurrents, 10/19 at 8 a.m.